Lock in a great price for The Old Quay House Hotel – rated 8.8 by recent guests! The room was elegant. Shower luxurious and the amenities plentiful. Fresh milk for tea. The food was well prepared and the portion sizes were just right. The staff were extremely helpful and friendly. The view from the room and restaurant was amazing. The bedroom was very comfy, shabby chic furniture and colour coordinated. Beautiful room with amazing waterfront views. Super comfy, really large bed. Relaxing drinks on the sunny waterfront patio followed by a lovely meal in the hotel restaurant. All the staff were really pleasant. Staff was exceptional. They were very friendly and helpful. Our room overlooked the river with big windows. The view was beautiful. The room was spacious and very comfortable. It was absolutely perfect. The nicest welcome I’ve had at any hotel - just lovely staff. Excellent service. Friendly and very efficient. Spotlessly clean. Excellent breakfast. Dinner was excellent too. Great location for the town. Thoughtful additions such as communal fridge offering fresh milk for complimentary tea and coffee in room. DVDs and books to borrow too. A minor electrical problem was dealt with immediately by the General Manager who was both helpful and charming. Breakfast was incredible. The staff went out of their way to be helpful and inviting. The hotel was excellent. The views, the food, the bedroom and the location. A luxury hotel in Cornwall overlooking the Fowey’s attractive waterfront, the award-winning Old Quay House has a waterside terrace with estuary views. Wi-Fi is free to use, and free parking permits are provided. The restaurant has stunning views of the estuary, and offers food made from local produce. River oysters and pan-fried Cornish scallops feature on the menu, along with a carefully selected wine list. A full cooked breakfast is provided each morning. Rooms at The Old Quay House Hotel have elegant, modern décor, and come with a TV. Each also features its own bathroom with White Company toiletries, and facilities for making tea and coffee. A variety of shops, restaurants and bars are just yards away. You can also enjoy boat trips along the river. 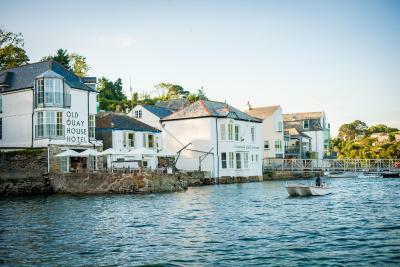 When would you like to stay at The Old Quay House Hotel? Classic room with views over the streets of Fowey. It has a king-size bed, TV, and tea and coffee-making facilities. Extra touches include bottled water, bathrobes, hairdryer and guest toiletries. Superior rooms have a partial view of the estuary and a small balcony. They each have their own bathroom, along with facilities for making tea and coffee. Located at the front of the hotel, these rooms have a super king-sized bed and picturesque views. Each comes with a TV, tea and coffee-making facilities, waterproof jacket and umbrella, as well as toiletries and bathrobes. This suite has scenic views overlooking the estuary, and features a free-standing claw-foot bath and polished wooden floor. House Rules The Old Quay House Hotel takes special requests – add in the next step! The Old Quay House Hotel accepts these cards and reserves the right to temporarily hold an amount prior to arrival. Please note that the hotel does not have a car park, however you can be given parking permits for the Old Station Yard car park which is 2,400 feet away. It is important that on arrival in Fowey you drive to the hotel to get your permit. The car park is a long way from the hotel and it was difficult to transport luggage but other than that it was a very pleasurable stay. Location on the water was stunning! Television only worked on few channels. Room 2 - very noisy due to road proximity. Restaurant - nouveau cuisine and quite pricey. Everything delighful with the exception of below. There was nothing there to dislike! There were videos and books to borrow, milk on hand if required. There was nothing to dislike about the place. Oh yes, the free parking was a 10 minute walk away! Excellent location, brilliant n breakfast and friendly, easy-going staff. Very comfortable room with excellent facilities. Nothing - The Old Quay House lived up to our expectations, which were high! Customer service was first rate. Food was excellent and the location was perfect. The decor in the rooms was lovely. The dining room and lounge area were superb and the staff couldn’t be more friendly and attentive and food was brilliant. We shall be back!! !